I don't stress it so much anymore. YES. Without a doubt, I love my house when it's clean. I would love for it to stay that way every second of my life. But not at the expense of not living in it. So although I accept it for what it is (loved in and lived in) I also refuse to give up my quest for a sustainable cleaning habit. "Take the 30 seconds to fluff your couch pillows when you stand up." Let's just talk about that for a minute, okay? First of all -- how are they even living in a house that still has pillows on the couch?! Mine are all in the basement, because in reality they are actually bricks to the princess castle, NOT, in fact, couch pillows like I thought. And 30 seconds to fluff some pillows every time I stand up? I don't even EAT that often. And I like to eat. Clearly, these articles are not for the desperate. And by "desperate" I of course mean, "the people who have children and have very nearly forgotten what the word "clean" means except that it's actually the thing they dream about the very most -- if they ever actually get to sleep long enough to dream." You know, people like me. It makes me want to write some articles for my kind of people. "3 Tricks for a Clean-ISH house." 1. Move across the world. Most of your stuff will get lost or broken. Or you'll decide it's just not worth picking up, putting it in a box, and then picking it up out of that box on the other end and finding it a place to live AGAIN. Less stuff = less chance it will be lying in wait on the floor in the middle of the night. 2. Send your children to their grandma's house. Clean your house once and for all. And then cry a little bit, and mourn the "what could be dreams." Eat ice cream. Be sure to wash the bowls before your kids come home, or you'll totally have to share the little ice cream that is left in your "sanity carton." 3. Why do you not have a "sanity carton" of ice cream? It's probably a good thing that I make cookies instead of writing cleaning articles. Like these cookies! I made them for a barbecue themed baby shower, but by happy chance...they are also PERFECT for Father's Day this weekend! And you get to use a cutter you probably already own! 1. It's a flip-flop cutter! Place a round cutter on the widest part of the flip-flop and use a food color marker to trace around the bottom half of the cutter. 2. 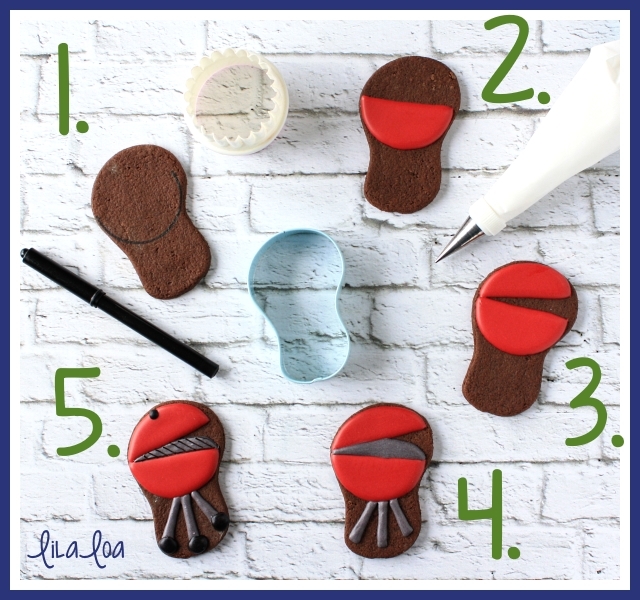 Outline and fill the bottom half of the semi-circle with medium consistency red icing and a #3 tip. Let it dry for 15 minutes. 3. Outline and fill the top half of the grill with the same icing. Let it dry for another 15 minutes. 4. Use medium consistency gray icing and a #2 tip to fill in the grill area and add 3 legs on the grill. Use a scribe or toothpick to push the icing into the tiny area at the back of the grill. Let dry overnight. 5. Use a food color marker to make the grill lines. I also like to outline the entire grill area with the marker. But that's my issue. You don't have to make it yours unless you want to. Use medium consistency black icing and a #3 tip to pipe 3 dots of icing for wheels and a smaller dot of icing at the top of the grill for a handle. Want to see it in action instead of taking 30 seconds to fluff your couch pillows? I thought you might. You can use the same cutter to make PICNIC SANDWICH COOKIES too! And what's a barbecue without chips? 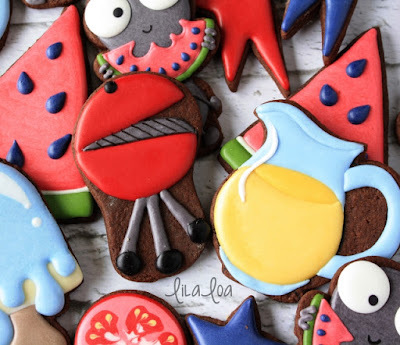 Make some DECORATED CHIP COOKIES to go with them!